Nice that iCal offers an option to hide completed task items after so many days, but no option to show uncompleted tasks only so many days before their due dates? 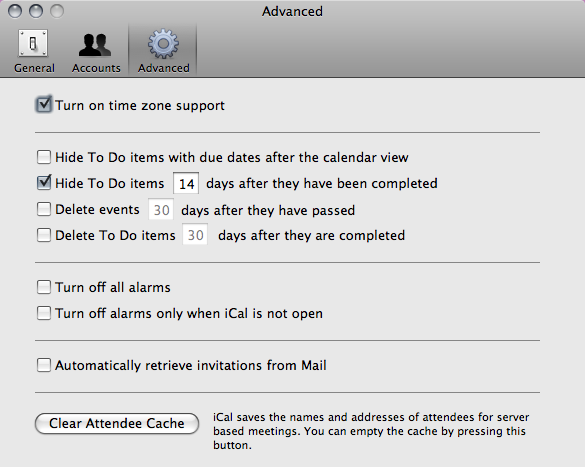 I have some tasks set for as far out as May 2009, but iCal’s options allow only an all-or-nothing approach. I get to see every uncompleted task or only tasks whose due dates fall outside the current calendar view. I rarely use month view because my calendar has enough items in it to make month view nearly useless, so I’d rather be able to set an option to see all uncompleted tasks due within 14 days, for example, no matter what view I’m using.